RYA Powerboat Level 2, BCU Kayaking and Canoe, VHF DSC Radio, Day Skipper Theory and Marine First Aid Courses available. Royal Yachting Association and British Canoe Union Centre with an excellent reputation for delivering high quality tuition at a great price. Here at Perfect Day Watersports we only use the best equipment and aim to give you just what you want to build your confidence and expertise at a pace that suits you, at a time of your choice. A great present for someone special or just because you deserve it. Indulge yourself and learn new skills that could change your life. If you want any advice or clarification then don't hesitate to use the 'contact' section of this website or ring 07887 890389. 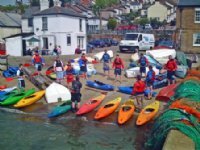 Location The Perfect Day Watersports Centre is located in the old town of Leigh on Sea, near Southend on Sea, Essex with the tidal estuary literally on our doorstep. For more than 600 years this has been a thriving maritime village with a rich history of fishing, smuggling and sailing. These days the old town is a popular destination for tourists sampling the excellent local restaurants, cafe's, bars and beautiful estuary views. The local rail station at Leigh on Sea is a short scenic walk away, only 45 minutes from central London by train. Why Perfect Day Watersports? We love to have fun and deliver only the very best training and coaching. We only use experienced senior instructors with a proven track record in Watersports. We specialise in small group or individual training with the emphasis on quality rather than quantity. We also offer free advice on buying your own equipment with the emphasis on saving you money by buying right, first time. Most of our guests come back for further sessions as their skills develop. With an enviable safety record and a great list of equipment that includes Venture Flex Kayaks and the latest powerboat equipment. Add to this the best instructors and you are guaranteed a special day on the water. If you are looking for the best then get in touch. With over 15 years experience on the water you can't go wrong with a 'Perfect Day'. Public liability insurance of £3,000,000 is provided by GJW.